So I know there are countless Brownie recipes and everyone loves their brownies slightly different. Personally, I love brownies that retain a gooey quality and that have a strong chocolate flavor. So this is my ideal recipe. This was passed on to my family years and years ago and has been our tried and tested brownie recipe ever since. For me, the key is to take these out when a skewer is coming out not quite clean, that way once they cool down they will be crunchy on the outside but still nice and a little gooey on the inside. The large amount of cocoa powder gives these an amazing rich chocolate taste that I adore. Sift in the flour and baking powder. Add chocolate bits then mix well until the mixture shines. Bake for 1 hour. I start checking at around 55 minutes to make sure I don’t overcook them. They turn from perfectly under-cooked to cake in only a couple of minutes. Carefully remove from tin and allow to cool completely. This recipe makes quite a lot of brownies (that’s as specific as I can get haha) so be prepared to share around! If you try them out be sure to let me know how you go. 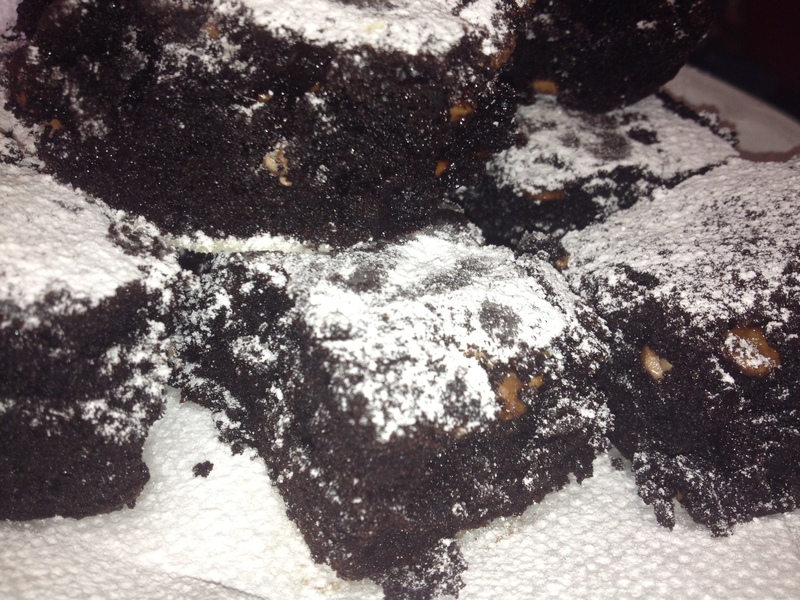 I find with most brownie recipes I need to tweak them to fit my preferences so tweak away! Just in case you wanted a terrible closeup of my last batch! Somehow I lost all my carefully taken photos of my “blog” batch so had to revert to these haha. They look quite cakey as they are still very hot but once cool these become more solid, with a crunchy exterior and chewier inside.